We anchored in Ile de Salute and had in no time some friends. – Read the book “papillon” and you know all about the island and its prisoners! 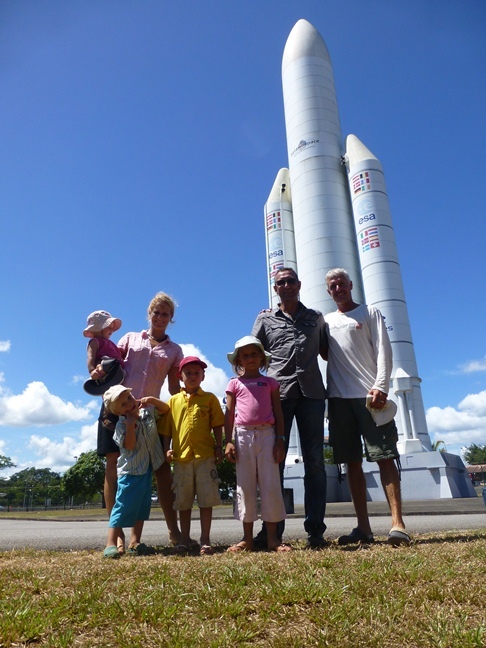 – The french military stocked us up with food and we got invited to see the space center in Kourou (Ariane). We were able to stay at Christophe Escorihuela’s house. He is an air controller and very friendly. At the moment we just get a lift to the zoo. We also met Patrick Deixonne (Ocean Scientific Logistic). He is one of the great French explorer and was rowing in 44 days over the Atlantic. His next project is the “7 Continent” project, where he asked TOPtoTOPs support in the Northern Pacific. The plan is to collect sientific data about the plastic waste supported by satellite observations (NASA, CNES). Therefore we will have to drag for one hour a day transponders and a special drag to capture micro plastic waste behind Pachamama. –Congratulation to David Hocking (Jacqui’s brother) about his research success on Leopard Seals! Read more…. 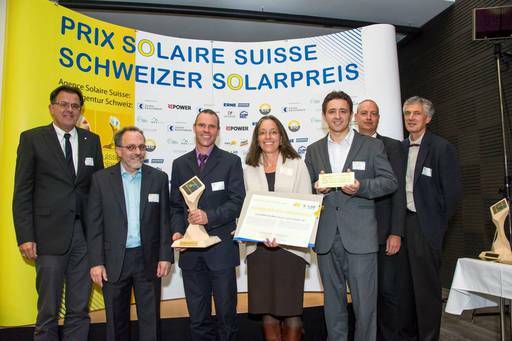 –Congratulation to Mengia Mathis (Dario’s relative) for getting the Swiss Solar Price! 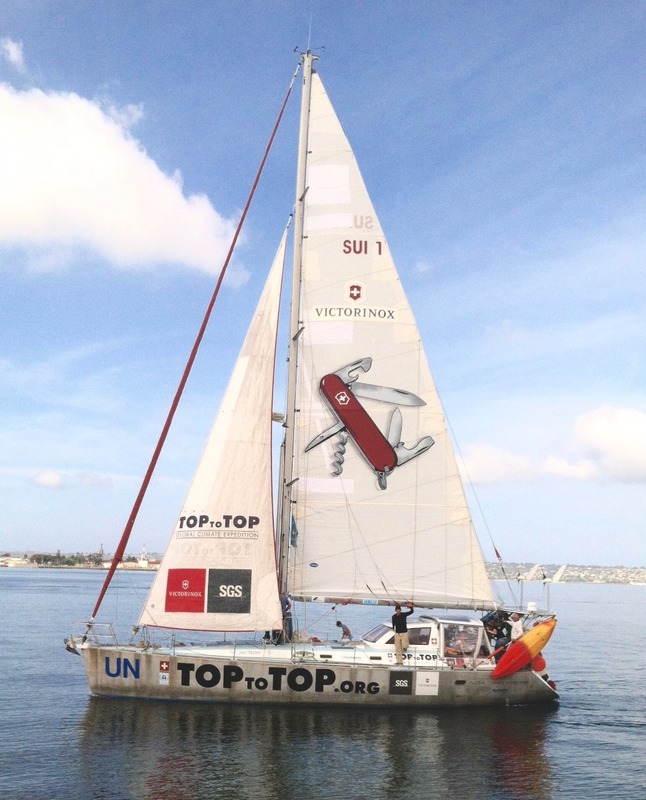 May a best practise example we can study at the next TOPtoTOP Climate Solution Award Expedition? Read more….…. –New TOPtoTOP member “Ina Hug” born on the 21st of October 2012! Congratulation! I am in India and was recently at the Airya Vaidya Pharmacy and Hospital in Mangarai for 21 days. The hospital is located on the slope of a mountain in a forest, 1h30 mins away from the city centre. It was amazing to hear wild elephants from afar, to see wild peacocks, and bulls. It seems wild elephants roam around, but I did not see one. However I walked around the forest as much as I could and it is difficult to describe the sense of beauty I experienced when walking amongst butterflies, coloured birds and tall, really old trees. 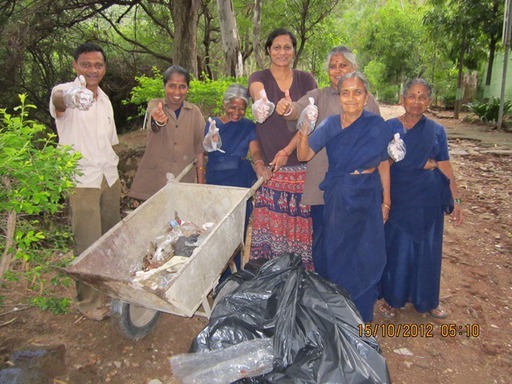 Alas, even in this beautiful remote place, plastic garbage of all sorts were littering the landscape: bottles, sweet wraps, plastic bags, etc…I could not leave without trying a cleanup. I shared the Toptotop vision with the Officer in charge of the hospital and he willingly accepted the idea of clean up: today, 15th October, in between the rains (it rained whole week), with a small group of volunteers (staff of hospital), we cleaned up the surroundings of the hospital during half an hour and we gathered 5 huge bins of plastic garbage. It is an astounding number for such a short period of time. We were all very happy to see restored cleanliness to this beautiful slope. This moment will be one of my cherished moments. Wherever we are, we can make a difference. If each one of us seizes opportunities to touch other people’s minds and hearts and reach out for the best in them, we will be pleasantly surprised. I am leaving this place tomorrow for the city centre, but I step away from the forest with beautiful memories. I have a strong thought for the members of Toptotop Mauritius who would have loved this place and you were all in my mind during this clean up- was remembering your enthusiasm, commitment and our passion when cleaning up mountains in Mauritius.